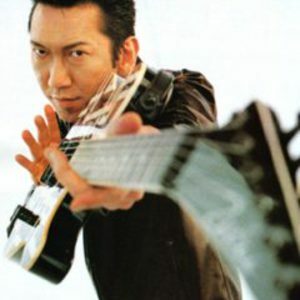 Tomoyasu Hotei (?? ?? , born February 1, 1962 in Takasaki, Gunma Prefecture) is a Japanese musician, guitarist and actor. Hotei rose to prominence in the 1980s as the guitarist for BO&Oslash;WY, one of Japan's most popular rock bands, before starting a solo career. In 2003, he was ranked number 70 on HMV Japan's list of the 100 most important Japanese pop acts. He ranked second in a 2011 poll on who the Japanese people thought was the best guitarist to represent Japan after Tak Matsumoto. Hotei is best known internationally for his song "Battle Without Honor or Humanity" , which has been used in numerous films, commercials, and video games, most notably Quentin Tarantino's feature film Kill Bill. Born to a Korean father and a Japanese/Russian mother, Hotei first began playing the guitar in junior high school. In high school, his band Blue Film finished runners up in a school contest to Death Penalty, a band led by Kyosuke Himuro. Hotei was expelled shortly before graduation. The reason was that, when warned about his long hair he replied ?Jesus had long hair!? Shortly after, he went to Tokyo where one day he received a phone call from Himuro. The two had never really known each other but hit it off and went on to hold auditions for a new band, which in 1981 became the six-member BO&Oslash;WY. The band became major stars in Japan, in 1985 played the Marquee in London, and in 1986 had their first million seller, Beat Emotion. When the band broke up in 1988, Hotei established himself as a solo star, as did Himuro. Hotei also made two albums with Koji Kikkawa as Complex, both of which went to number one in the national charts. Hotei frequently records overseas and has collaborated with many foreign musicians, including playing on The Stranglers Hugh Cornwell's 1993 solo album, on stage with David Bowie at Nippon Budokan in 1996, and at the closing ceremony of the Atlanta 1996 Centennial Olympic Games with Michael Kamen. He later recorded ?Guitar Concerto? with Kamen. He has also worked with Andy Mackay of Roxy Music, guitarist [artist]Chris Spedding and Mike Edwards of Jesus Jones. Hotei also sometimes plays in Europe, including a number of major festivals. His regular drummer in recent years, Zachary Alford, has previously played with Bruce Springsteen and David Bowie. Hotei's 1998 album Supersonic Generation, recorded in part with Apollo 440 and Ofra Haza, was released in 14 European countries. In addition to many bestselling solo albums, Hotei composed and performed the score for Hiroyuki Nakano's Samurai Fiction, as well as starring in the film. He composed the score to Terry Gilliam's feature film Fear and Loathing in Las Vegas together with Ray Cooper. Hotei's song ?Battle Without Honor or Humanity? was used in the Quentin Tarantino's feature film Kill Bill, the PlayStation 2 version of Dance Dance Revolution SuperNOVA,and Michael Bay's feature film Transformers. Hotei recorded a cover of John Lennon's ?Happy Xmas (War Is Over)? for Merry Axemas, an instrumental guitar Christmas album featuring tracks from guitarists including Jeff Beck, Joe Perry, Eric Johnson, Steve Vai and Steve Morse. The Nintendo DS game Osu! Tatakae! Ouendan features his song "Thrill". The game's sequel, Moero! Nekketsu Rhythm Damashii, features another Hotei song, "Bambina". (Both songs are cover versions.) Hotei is featured in ?Grace? on the Apocalyptica album Worlds Collide. The song is featured in the game NHL 09. Rock The Future 2005 - Monster Drive Party!! !